Stanford University Press, 9780804762298, 56pp. The three essays collected in this book offer a succinct introduction to Agamben's recent work through an investigation of Foucault's notion of the apparatus, a meditation on the intimate link of philosophy to friendship, and a reflection on contemporariness, or the singular relation one may have to one's own time. 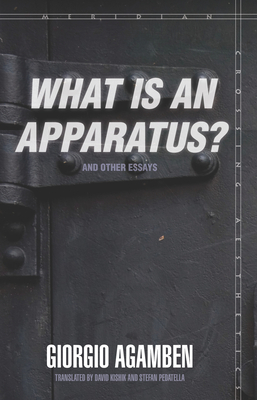 "Apparatus" (dispositif in French) is at once a most ubiquitous and nebulous concept in Foucault's later thought. In a text bearing the same name ("What is a dispositif?") Deleuze managed to contribute its mystification, but Agamben's leading essay illuminates the notion: "I will call an apparatus," he writes, "literally anything that has in some way the capacity to capture, orient, determine, intercept, model, control, or secure the gestures, behaviors, opinions, or discourses of living beings." Seen from this perspective, Agamben's work, like Foucault's, may be described as the identification and investigation of apparatuses, together with incessant attempts to find new ways to dismantle them. Though philosophy contains the notion of philos, or friend, in its very name, philosophers tend to be very skeptical about friendship. In his second essay, Agamben tries to dispel this skepticism by showing that at the heart of friendship and philosophy, but also at the core of politics, lies the same experience: the shared sensation of being. Guided by the question, "What does it mean to be contemporary?" Agamben begins the third essay with a reading of Nietzsche's philosophy and Mandelstam's poetry, proceeding from these to an exploration of such diverse fields as fashion, neurophysiology, messianism and astrophysics. Giorgio Agamben, a leading Italian philosopher and radical political theorist, is Professor of Philosophy at the University of Venice. Stanford University Press has published six of his previous books: Homo Sacer (1998), Potentialities (1999), The Man Without Content (1999), The End of the Poem (1999), The Open (2004), and The Time that Remains (2005).